In an article by Jacob Hannah for USA TODAY, he states that nearly 9 out of 10 teenage drivers have engaged in distracted-driving behaviors such as texting or talking on a cellphone even though most of them know that their actions increase their risk of crashing. The survey by Seventeen magazine and auto club AAA highlights the difficulty of the nation's efforts to stop texting while driving, especially among young drivers. "Teens do continue to drive distracted even when they recognize the dangers," says William Van Tassel, manager of AAA's driver training programs. "Driving is the first real adult responsibility, but let's face it, they're still teens whose brains aren't fully developed." 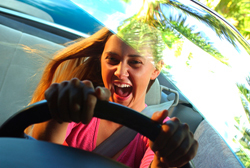 The online survey of 1,999 teens ages 16-19, conducted in May 2010, found that 84% were aware that distracted-driving behaviors increase their crash risk; yet 86% have engaged in those behaviors, including texting and talking on cellphones, eating, adjusting radios, driving with four or more passengers and applying makeup. Almost 6,000 highway deaths each year involve distracted driving, the National Highway Traffic Safety Administration says. "Everybody has heard the message that distracted driving can raise your crash risk," Van Tassel says. "They're getting the message, but their personal experience may influence them in the other direction." That's what happened to Cheyenne Tontegode, 18. She was a passenger in a car driven by a friend last year in their hometown of Lincoln, Nebraska, and both girls were texting, Tontegode says. "She was either texting somebody else, or I was showing her something on my phone," she says. "I looked up and saw that we had started to get over into the other lane. I called her name. She looked up, overcorrected, and we hit an SUV head-on." Tontegode, who wasn't wearing a seat belt, was in the hospital for 10 days. One of her legs was cracked in 14 places, and she had broken ribs and glass in her eye; her friend was hospitalized for 14 days, she says. She says she had gotten the texting-while-driving message before the crash. "Well, yeah. Of course you hear it. You hear it all the time from adults," she says. "But people don't think about it until it happens to them, unless they get the message from another teen. If it happens to another teen, then I think they listen." Tontegode says she now wears her seat belt "all the time," and her friend "only texts when she's at red lights. The minute it turns green, she puts her phone down and doesn't look at it again until the next red light." The survey indicates that focusing solely on texting while driving will not eliminate distracted driving among teens. The top three behaviors that respondents had participated in: adjusting a radio/CD/MP3 player (73%), eating (61%) and talking on a cellphone (60%); 28% had sent a text message. Drivers ages 18-19 are more likely to engage in distracted driving than those 16-17. Teens gave researchers startling reasons why they engage in distracted driving: It takes only a split second (41%); they don't think they'll get hurt (35%); it makes driving less boring (22%); and they're used to being connected to people all the time (21%). Teens driving their own vehicles are more prone to distracted driving than those who share an automobile with others. For instance, 20% of teens who share vehicles had texted while driving, compared with 35% of teens with their own cars. Wisconsin residents, contact knowledgebroker Kori Cumley for more information.